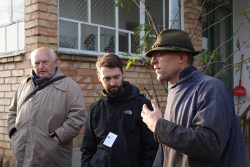 Transmitting agroecological knowledge supposes that the trainer is in a position to focus on skills that are the object of training and on the conceptions of learners in terms of agroecology and agroecological knowledge. Certain agroecological skills are acknowledged from a scientific point of view and are the object of abundant literature, many of these are skills based on experience or hybrid knowledge combining scientific knowledge with skills related to observation and experience. This latter category is often ‘intimate’, non-conscietised and more delicate to define. In answer to the question ‘how do you do that ?’ or’how do you know about that ?’ the person holding the knowledge could well reply: ‘I’ve always known’ or ‘it’s obvious’ without being able to give more details. Focusing on these skills therefore requires special investigation methods. Agroecology, like certain related skills, may also be the object of controversy or at least some divergence of points of view. It would therefore appear all the more justifiable to promote the expression of conceptions carried by the learners. (1) approaches enabling a focus on learners’ conceptions on notions of agroecology and agroecological knowledge. These approaches can be deployed at the start of a training course and/or at the end in order to evaluate the level of acquisition and evolution that the training has enabled. (2) approaches enabling identification of the agroecological knowledge to be transmitted. These approaches may be deployed by the trainer before a course but may also represent a block of the training process in their own right, when the identification is carried out with the learners.